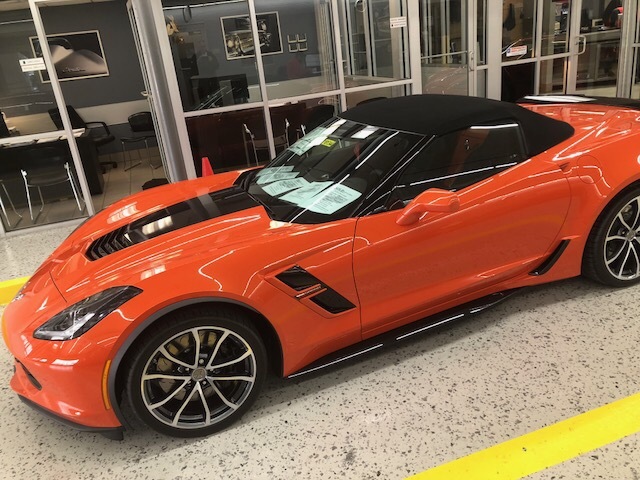 This Friday at 10:00 AM @ Criswell Chevrolet, Mike will deliver his 4,000th Corvette, truly making Mike a 1 of 1 – the only salesperson in the history of GM to sell 4,000 Corvettes. The owner of this beautiful Grand Sport is Mike Hamilton, Battalion Chief for the Montgomery County Fire dept. It is Sebring Orange, looking great with its coordinated black top and interior. Also present at the special ceremony, will be the owner of the # 3,000 delivered Corvette which Mike sold on January 13, 2014 to Richard Greenwald, also a Maryland resident. Richard will be bringing his 2014 Stingray Z51, Limerock Green convertible to the celebration. 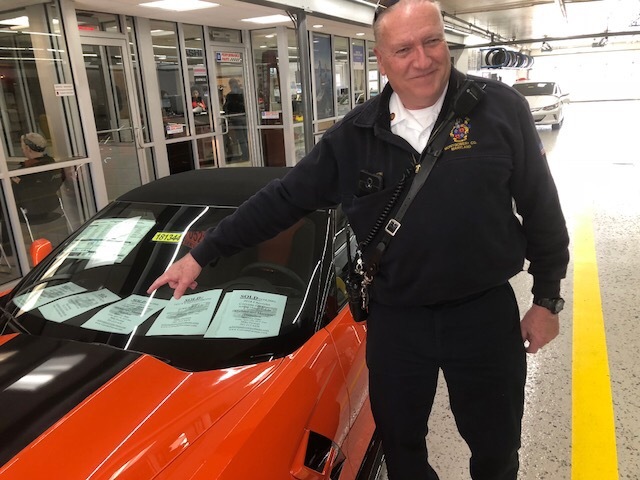 For those who are planning ahead, and we know Mike always also has an eye on the future, Mike is looking forward to selling his 5,000th Corvette. Betting it will be a convertible – for aren’t we seeing a pattern here. Congratulations to Mike Furman on his extra special sales accomplishment! Congratulations to Battalion Chief Hamilton on his gorgeous new GS! Last edited by elegant; 04-11-2018 at 05:00 PM. Mike [email protected], jsvette, SgtMajUSMC(Retired) and 11 others like this. Mike [email protected] and recoto like this. Mike [email protected] likes this. elegant, Mike [email protected], Boomer and 1 others like this. Way to go Mike! This has got to be so far off the charts compared to the numbers other Corvette salespeople put up. Here's to number 5000.
elegant, Mike [email protected] and Juliesvett like this. I'm shooting to be number 5000! Awesome job sir. And what a color combo. ps: not sure if mine will be a convertible.....I reserve the right to change it prior to pickup. elegant, Mike [email protected] and U.S. Marine like this. What a milestone. Keep rockin Mike! Congratulations Mike. What an awesome accomplishment. If anyone deserves to be in the Corvette Hall of Fame, it’s you. Thanks for your service to our enthusiast community. elegant and Mike [email protected] like this. Congrats Mike! I may have to witness this awesome achievement in person! Mike [email protected], elegant and Ateupjoe like this. Previous Vettes: '69 LeMans Blue vert, '96 black coupe, '99 black coupe, '05 LeMans Blue coupe. Congratulations on your achievement. Well deserved I'm sure. Congrats Mike. It is no surprise you are the only GM salesperson to hit that mark!!! Mike [email protected] and elegant like this. Congrats Mike! A super achievement by a super guy and friend. Mike, congrats on your 4000th Masterpiece sold, that milestone should be recorded in the General Motors history archives. Mike I'm sure that the General has noticed your outstanding achievement, if we were on the battle field you would be the Generals no.1 battlefield commander!!! Job well done!! Mike [email protected], twowinns and elegant like this.